Most days art Critic Paul Carey-Kent spends hours on the train, traveling between his home in Southampton and his day job in Surrey. Could he, we asked, jot down whatever came into his head? 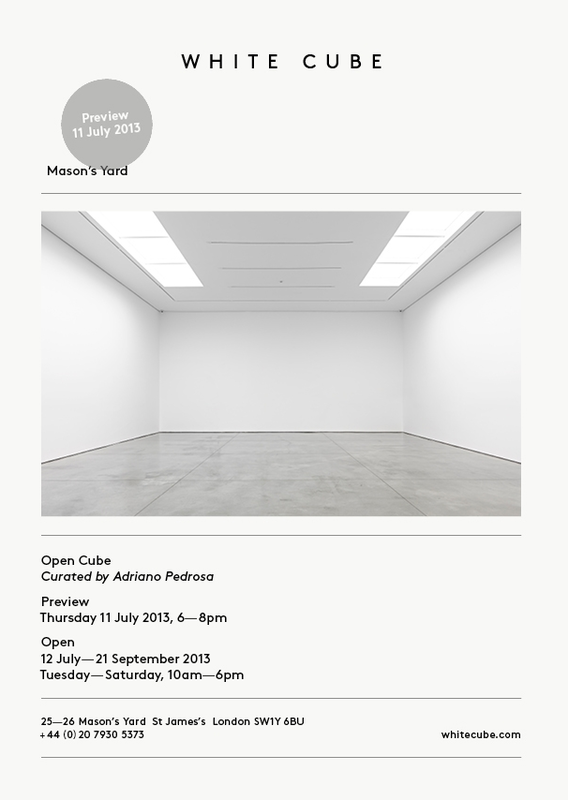 White Cube’s Masons Yard summer show includes six of Martin John Callanan’s striking series ‘The Fundamental Units’. Callanan uses thousands of exposures via a 3D optical microscope at the National Physical Laboratory to achieve intensely detailed (400 million pixels) images of the lowest denomination coins, here printed at over 50 times life-size. This elevation of the near-worthless reveals the construction and traces of circulation invisible to the naked eye. It also has a mournful aspect, as many of lowest value coins (Callanan has captured 16 of the 166 currently in use) will doubtless be withdrawn from circulation soon enough. As you can see at www.greyisgood.eu, Callanan has good form for obsessive projects, such as taking 2,000 photographs of floors in important buildings with restricted public access . 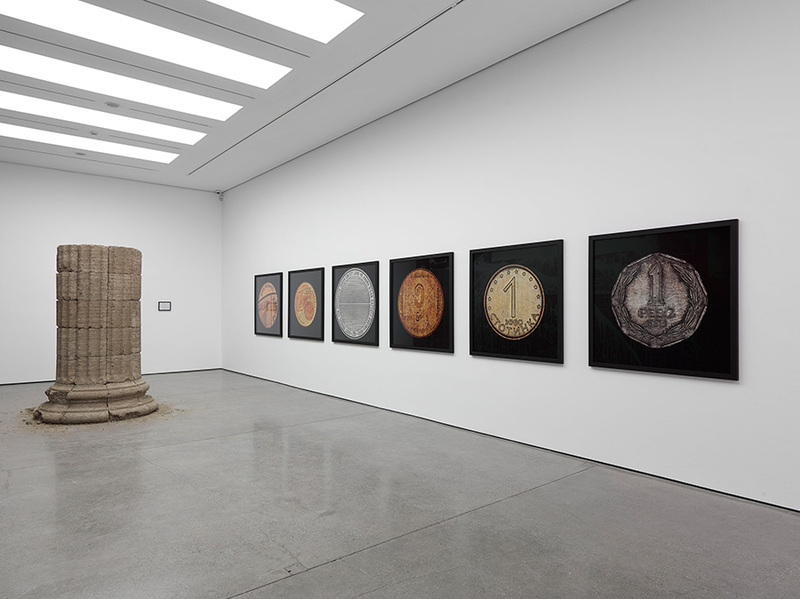 ‘The Fundamental Units’ reminded me of a similarly-sourced but psychologically contrasting series : Moyra Davey’s late 80s series of 100 ‘Copperheads’, which concentrate on one coin – the US one cent – to show the range of scratching, rusting and tarnishing inflicted on the most famous American. 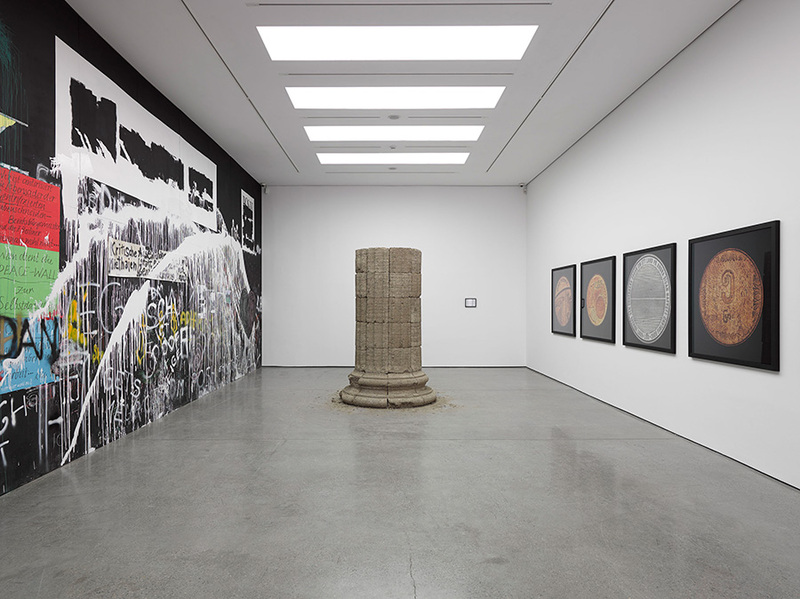 These, focusing on one national economy at a time of recession – and currently on display at Tate Liverpool during the next recession – become harder to read as the damage tends towards abstraction. But then, isn’t the whole convention of money an abstraction of sorts? Curator Adriano Pedrosa pulls off a neat balance with this open submission show: the works feel raw but undaunted in these august surroundings. 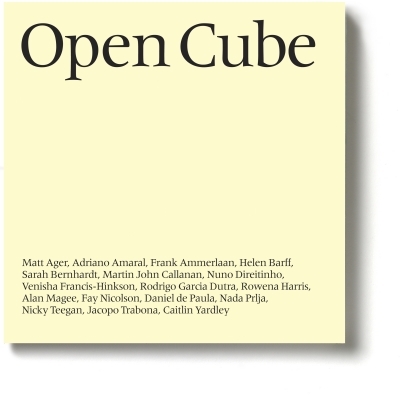 Open submission shows can be sprawling affairs, so Open Cube is a rarity: Brazilian curator Adriano Pedrosa has culled 17 artists from 2,900 applications to create an enjoyable and coherent show. Part of its novelty lies in subverting its setting. 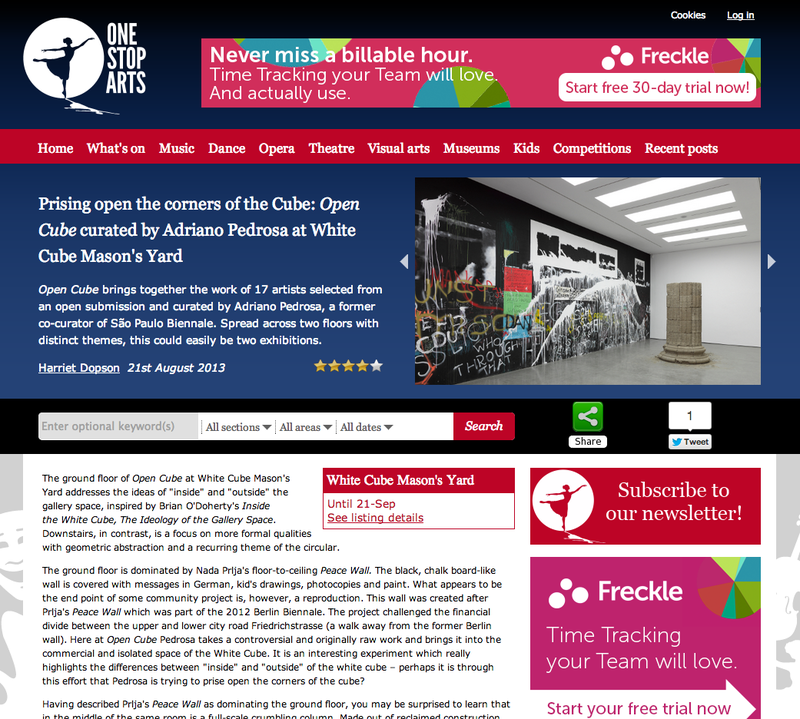 White Cube is usually an elite stage where works fetch thousands of pounds. But Pedrosa has invited gatecrashers, most young and based in London, to take over. This mischievous frisson would count for little if the work didn’t stand up to the grand galleries but it does. 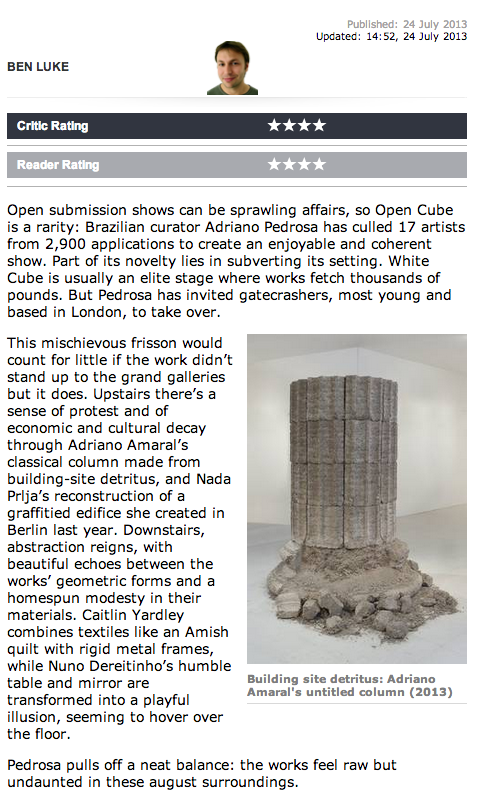 Upstairs there’s a sense of protest and of economic and cultural decay through Adriano Amaral’s classical column made from building-site detritus, and Nada Prlja’s reconstruction of a graffitied edifice she created in Berlin last year. Downstairs, abstraction reigns, with beautiful echoes between the works’ geometric forms and a homespun modesty in their materials. Caitlin Yardley combines textiles like an Amish quilt with rigid metal frames, while Nuno Dereitinho’s humble table and mirror are transformed into a playful illusion, seeming to hover over the floor. Pedrosa pulls off a neat balance: the works feel raw but undaunted in these august surroundings.